A tree fountain in Dinosa, Podgorica, Montenegro. 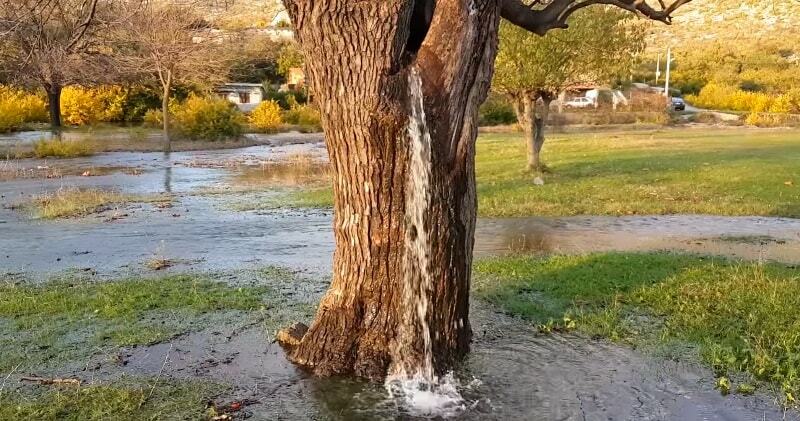 A rare and natural phenomenon has turned a tree in Montenegro into a gushing spring. The rains had flooded the underground springs and the additional pressure created pushed water up the tree trunk through cracks or hollows on the trunk, until it poured out of a hole a few feet above the ground. As you can see from the video, the ground is quite sloppy indicating the amount of groundwater there is in the soil and below. You can also see water gurgling out of other holes in the meadow. The entire area is flowing like a small stream. During this time, more than 100 liters of water can flow out every second.The local legend is that the witches of Tuhala gather in the sauna underground and beats each other vigorously with birch branches causing water to pour out on the surface.